The new Conservative-independent ruling coalition at Scottish Borders Council has refused to rule out the re-introduction of regular kerbside garden waste uplifts. The fortnightly green bin collections for 38,000 households were controversially withdrawn in March 2014 by the previous Scottish National Party-independent-Lib Dem administration despite an 8,000-signature petition demanding their retention. At last week’s full council meeting, Hawick and Hermitage councillor Davie Paterson said that cost-cutting decision had been “a major issue” at the local government elections in May. “Several candidates made a big play of this,” said Mr Paterson, previously executive member for environmental services. Selkirkshire councillor Gordon Edgar, executive member for roads and infrastructure, said that the council is reviewing all its kerbside collections as part of its overall waste management strategy. “No decisions will be taken on kerbside collection services until such time that a report has been presented to this council for consideration,” said Mr Edgar. Officers reviewing waste management have much to consider, including how to meet Scottish Government targets to restrict the amount of waste going to landfill and to maximise recycling. In 2015, a contract between the council and a private company to deliver an incineration-based waste treatment plant at Galashiels to divert 40,000 tonnes a year of household and residual waste away from landfill, was scrapped. 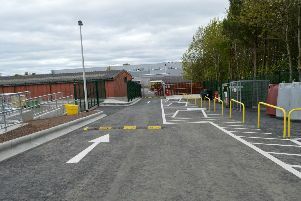 A subsequent proposal for a waste transfer station at the same site, at Easter Langlee, was refused planning consent in April this year.